Happy Teacher's Month Promo ~ Philippine Freebies, Promos, Contests and MORE! Astech Pengson Distributors Incorporated, the distributor of top-quality brands trusted in the market such as Sharp, Aurora, Epson, BenQ, Canon, Vanguard, Verbatim, Wilson, and Diplomat, is giving away lots of prizes in their Happy Teacher's Month promo. 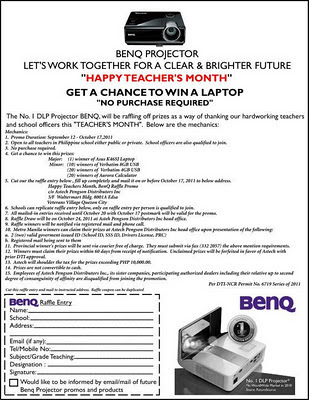 All public and private school teachers and officers are encouraged to join by simply downloading the raffle entry from their website or from BenQ's FB fanpage and submitting it via mail. Your school may replicate the form for all of your faculty members. Remember, one (1) raffle entry per person only. One lucky winner will get a cool Asus K43SJ laptop while others take home either Verbatim 8GB or 4GB USB's or Aurora calculator each. Happy teacher's month!